I love the television show, “Restaurant Impossible.” This real life show is about how expert chef and restaurant entrepreneur Robert Irvine of Food Network spends two days trying to fix “failing” restaurants that have sought out his help. He and his team of designers diagnos and address the many layers of issues that have led to the failure of the restaurant. Most restaurants have significant debt, management problems, poor service, bad food, and unsightly disrepair issues. Every time I watch this show, I am astounded by the many crossovers that can be identified that directly compare to leading churches and seeking to minister to people. There are a lot of successful and faithful churches out there, and there are a lot of successful and faithful Christians. However, there are also what could be called, “failing” churches and Christians as well. Over the course of my ministry thus far, I have served as the Lead Pastor of two churches that could be considered, “failing” churches. The similarities between the issues that needed to be addressed in those churches and these restaurants are uncanny. Most churches and restaurant are started by good-hearted people who want to succeed. Many churches are started by people who have a passion to see the Gospel change people’s lives and the Kingdom of God built through their ministry. They love Jesus and want to see His Church be the redemptive hope of the world. Many existing Churches don’t have within their mindset the desire to fail, in fact most want to be faithful to God. In the same way, I have never seen an episode of Restaurant Impossible where the leaders of the restaurant ever desired it to fail. They started it with good intentions and probably still have many good intentions. In one episode of Restaurant Impossible, a restaurant owner/chef was convinced that his “homemade” barbecue (which actually wasn’t completely homemade) was the best. It tasted great to him, but obviously the customers believed differently. Even his own staff thought is was lacking (though a few faithful customers liked it). Otherwise, they would be filling the place with more business and new business. The barbecue recipe’ had been past down through generations, but for whatever reason, it not only didn’t taste good, it wasn’t homemade, and the customers were not buying it. Part of Robert Irvine’s challenge was to help the owner/chef come out of denial about his barbecue recipe and see that what may taste good to him and honor a family tradition is actually working against the purpose and success of the restaurant. Obviously, the goal of a church isn’t to solely please the customer, but it is to present the Gospel in ways that people can digest and taste and see that the Lord is good. Churches should never change the meat of the Gospel, but the way we present it should always be changing. The traditions of man have often become the enemy of church effectiveness. Like the chef/owner, failing churches are often serving up traditions and ministries that taste good to themselves, but are not reaching people far from God with the Gospel. Churches that are merely keeping their members happy and maintaining their existence are in my mind, “failing” churches in the sense that they are failing to reach their redemptive potential and their calling by God to reach people far from God at all costs. In the Kingdom of God, maintenance does not equal success it equals failure. Unfortunately, the follow up to this episode of Restaurant Impossible found the chef/owner actually going back to the old barbecue recipe despite the overwhelming response from customers regarding their delight in the new recipe provided by chef Robert Irvine. This same response is common among some churches as well. At the end of the day, they would rather hold onto traditions and what serves them then succeed at their ultimate calling and purpose as a church. In a sense, they have become comfortable with failing and blaming everyone else but themselves. However, where when a restaurant fails, it costs the owners most of all. When a church fails, it costs lost people most of all. Worst case senario for the church and its members, they have to close the door and find another club with a cross on top. Worst case senario for lost people, they spend eternity separated from God. The cost of denial in church world is far greater than restaurant world. 3) Failing Churches and Restaurants are often led by discouraged people. By the time a restaurant or church comes to the place where they are willing to admit that they need help, they are often discouraged. Some people/employees surely bolted long before they sounded the alarm, but those who remain are likely frustrated, burned out at some level, and scared. Which in some instances adds to their stubbornness against the very things that can make them well. Some are so discouraged that they would rather just give up or resist change instead of taking a new path towards success and wholeness. Yet for those who have a flicker of passion remaining, a fresh sense of vision and hope can spark revitalization. Unfortunately, the very discouragement than can press an owner or a group of leaders to get help and implement fresh ideas and strategies, can be the very discouragement that once removed by new success, can lead back into negative patterns. Some people are attracted to conflict and drama, and success scares and intimidates them more than failure. For these types of leaders and groups, a deep change in their core mindset is needed to move into the potential of their restaurant or church. It’s amazing for me to see how many restaurants ask for chef Robert’s help and then are blessed with the tremendous wisdom, fresh vision, new effective ideas and strategies that come from chef Robert and his team that prove to be successful in their context, only to weeks later go right back to the very behaviors and strategies that caused them to fail in the first place. It reminds me of a scene where Jesus sees a man who said he wanted healing, had been sitting near a healing pool for years, and had all kinds of excuses why he never had gotten in and become healed. Jesus senses the irony and asks him, “Do want to get well?” Jesus knew, just because you say you want something doesn’t mean you are willing to do what it takes to get it. So many churches, people, and apparently restaurants say they want to get well, but when the reality of it meets their life, they are resistant and even rebellious to make the necessary changes. Everybody wants change without changing anything, especially themselves. Many churches and restaurants that are failing are led by the same people, in the same ways, doing the same things, with the same methods, but expecting new results. That is insanity and will prove to be unsuccessful. 5) Failing Churches and Restaurants often don’t see their irrelevance to the needs of people. From having restaurants that have way too many items on their menu, to having outdated and tacky decor. From having food that is tasteless, processed, and flat out gross, to having items on the menu nobody is buying. Many of the restaurants chef Robert seeks to revitalize don’t realize how irrelevant they are to the needs of their potential customers. Many owners, in fact, think their customers like the very things these same customers actually say they don’t. Furthermore, some restaurants even have a distasteful smell about them that the owners no longer recognize, but their customers certainly do. Many failing churches try to serve too many items on their ministry menu. Instead of accomplishing a few areas of ministry with excellence, they try to be all things to all people, and thus end up doing many things, but none of them very well. Many failing churches are serving ministries that lost people could care less about. A vision of reaching people far from God and maturing believers should be at the heart of every church. Yet, typically, failing churches do much more to take care of believers than to reach people far from God. In fact, I have never seen a church “fail” because they cared too much about people far from God and adjusting their ministries and priorities accordingly. Rather, I have seen just the opposite. When we begin to ask the question of each and every ministry within the church, “How does this effectively reach lost people or prepare believers to do so?” we begin to know best how to align our ministries and trim the ministry vine. Many failing churches don’t realize how poorly they are doing ministry. Unfortunately in the name of trying to be loving and friendly, many churches surrender to a mindset that believes being a spiritual organization of volunteers requires us to significantly lower our standards of excellence and effectiveness. Yet, God designed people to serve in areas of their passion, spiritual gifts, maturity level, and in line with the overall vision of the church so that ministry can be done skillfully, purposefully, and with excellence. Often times, chef Robert has to convince the chef/owner of what should already by very obvious… the food stinks, their methods stink, and their organization is flawed. This if often a tough reality to hear, but an important one. Many failing churches don’t realize how their outdated and tacky decor, image, and style is eclipsing their ministry effectiveness. I am amazed how restaurants and churches try to attract 21st century people with 19th century architecture, design, music, imagery, and decor. More and more, we live in a visual culture that is influenced by visual communication. Yet, somehow we think that when it comes to church, people will flip a switch and not care. This, is absolutely not true. Jesus used the communication tools and languages of his day, we should too. With every episode of Restaurant Impossible, chef Robert has to deal with some kind of internal disfunction amongst the leadership of the restaurant. Usually, it has to do with issues of power, control, and a lack of centralized leadership. Either people who should be leading aren’t leading (for whatever reason), or people who shouldn’t be leading are trying to run the show. Whatever the case, the dysfunction is obvious. Failing churches often have internal conflicts along with issues of power and control. In the same way as these failing restaurants, typically it stems from the reality that people who shouldn’t be leading are in fact the ones running the show. Perhaps they shouldn’t be leading because they lack the calling, maturity, skill, discipline, knowledge, vision, or heart, but nonetheless, they are leading. In the same way that chef Robert’s seeks to remedy these issues, failing churches need to establish who the earthly God-called leader is, give them appropriate authority to lead, clarify roles, define goals and values, and align people around them. Furthermore, once this has been established, the leader(s) must follow through with their responsibilities. Defining clear roles, establishing specific goals, organizing people and processes, and having good leadership is critical in both churches and restaurants. With every episode of Restaurant Impossible, chef Robert along with restaurant leaders are required to make tough calls. Whether it be in changing an entire menu, revamping the whole interior and look of the restaurant, firing employees, removing long held traditions or practices, or calling people into accountability, revitalizing a restaurant is difficult work. And even though many of them play along while the show is being filmed and the romance of a “new” restaurant is still present, many of these failing restaurants go back to some if not all the very things that backed them into a corner to begin with. The opportunity was there to move forward, but when it mattered most, they weren’t willing to do what it takes. Many “failing” churches say they want to grow, want to be relevant to culture, and want to reach people far from God, but when it matters most, they simply aren’t willing to do what it takes to see it happen. They aren’t willing to make the difficult decisions, take the needed risks, and face the necessary challenges. Good intentions don’t make great restaurants, nor do they build the Kingdom of God and lead churches to reach their redemptive potential. One of the highlights of Restaurant Impossible is the big reveal of the inside, physical renovations of the restaurant. It’s amazing what changes can be made and an entire restaurant be visually turned around in a matter of a couple days. But, as chef Robert has often said on the show, the physical renovations don’t mean much if the other areas of needed renovation don’t occur. One of the most important lessons I have learned about “failing” churches is that even though you may be able to renovate their style, ministry practices, and image, if you don’t renovate the hearts of the core people of the church it will eventually come crashing down. Unfortunately, as it is in restaurant world, so it is in church world. Renovating the heart of the core group in the church or restaurant can be challenging and sometimes (even often) impossible. Only God can change a heart and break through the deep seeded issues that are likely present in the hearts of the core people of a “failing” church. But with God, all things are possible. 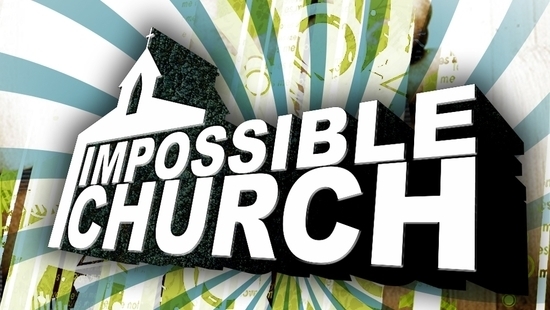 With Jesus, Church impossible becomes church possible. There has never been a Restaurant Impossible episode thus far of a restaurant that was beyond hope and potential for a great turn around. Every church is loved by God and filled with great potential. Whether a restaurant or church reaches this potential and comes into the hope they have is up to their willingness to receive and apply wise counsel. For churches this counsel is grounded in God’s Word, His purpose for His Church, and the faithful leadership of called pastors and leaders.